When Jaume Balagueró’s first feature length Los Sin Nombre was released in Spain in 1999, the hope for the then almost extint Spanish horror genre started being restored. Balagueró and other directors of his generation – like Paco Plaza (Rec, El Segundo Nombre) – reopened the door for Spanish audiences to take pride on national fantastic productions as previous generations had done (e.g. Ibañez Serrador’s series Historias para no dormir which provoked many a sleepless night in the 60s and 70s). Los Sin Nombre tells the story of Claudia’s daughter’s (Ángela) misterious disappearance. When Ángela’s body is found by the police, hardly any recognisable features have been left on it apart from a bracelet. Claudia (Emma Vilasarau) and her English partner (Brendan Price) identify the remains as their daughter’s and this allows the police to put an end to the investigation. Five years later, Claudia is still deeply affected by Angela’s death, her partner long gone, and she has become highly dependant on tranquilisers. Claudia is almost unable to cope with her work and other everyday professional and domestic duties. One day, Claudia receives a chilling phone call: it is her daughter Angela asking to be rescued from ‘them’. With the help of a former police agent turned detective (Karra Elejalde) and a bold journalist who specialises in the occult (Tristán Ulloa), Claudia starts unraveling clues in order to find her daughter. But the path to Ángela is full of false leads and terrifying traps. 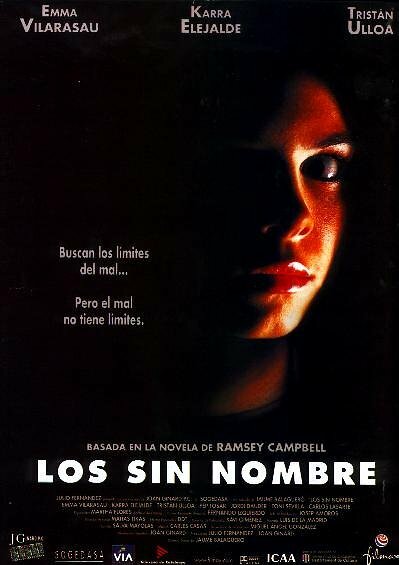 Los Sin Nombre was the first proof of Balaguero’s talent as a horror film director – a talent that he would develop to full potential in his subsequent films (Darkness, REC, Mientras Duermes).Los Sin Nombre is based on the homonimous novel by Ramsey Campbell who also co-wrote the script. The film does not fall into an isolated genre but rather mixes elements of thriller and horror with traces of melodrama (strongly underlined by a recurrent piano theme). Balagueró makes use of conventional formal devices such as dark rooms, mirrors, children and lunatic characters by means of which he creates a very disturbing atmosphere. There is more suggested than it is shown and this makes the film more approachable to viewers who are not necessarily fans of the horror genre. Jaume Balagueró and Paco Plaza are the minds behind the internationally acclaimed REC saga (fourth part to be released in 2014). Thanks so much! It’s definitely worth the effort when we read comments like yours!